The Snap Panel sets some recording related options and contains the global snap selector. Octave - Base octave for mapping the keyboard keys. NOTE: If you are using multi-sample based instruments make sure the Channel Settings option 'Add to key' is selected. Standard keyboard layouts - Piano or others such as Janko . The first image below shows the standard 'Piano' layout. If you have a Razer Chroma keyboard use the Razer Chroma FX plugin (Typing Piano mode) to illuminate the Piano keys. This is the Performance Mode layout used to trigger Clips, tracks refer to Playlist tracks. Special key maps - Other settings such as 'Blues', 'Major...', 'Minor...' etc. set the Typing keyboard to play in the given Key and/or Chords. 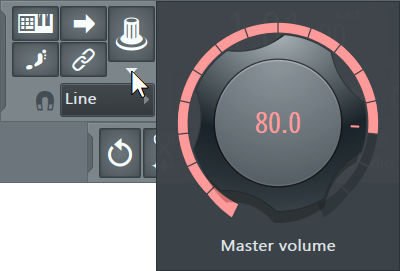 'FPC (C4)' and 'Slicex (C4)' are designed to work with the respective plugins. Auto Scroll - Auto-advances the Event Editor, Piano roll, Playlist and Step Sequencer when the play position marker nears the edge of the window. The Auto Scroll switch is linked to the (Scroll Lock ) key on your keyboard and will reset to the 'on' condition each time FL Studio starts (unless the keyboard Scroll Lock is on). Continuous scrolling (Right-Click) - The window continuously scrolls, click on the Editor background to reposition the Playhead/scroll center for the window. Multi-link controllers - This allows you to link multiple interface controls to MIDI hardware or internal controllers: 1. Select the Multilink-controllers icon to start the multi-link process. 2. Tweak some software controls. 3. Tweak the same number of hardware knobs/sliders/buttons on your controller and they will link in the same order the software controls were tweaked. Controller movements can then be recorded. Permanent links - Multi-links can be permanently remembered by FL Studio using the 'Override generic links' option (see below). Browser linking - When 'Multilink' is checked, selecting plugin parameters in the Current project browser adds them to the multilink. Edit events - Opens an Event Editor for each interface control tweaked. Turn on the switch, tweak controls then select this option. Init song with these positions - When play is pressed each tweaked control will adopt the value it was set to. Turn on the switch, tweak controls, then select this option. Create automation clips - Creates Automation Clips for each tweaked controller. Turn on the switch, tweak controls, then select this option. Link to controllers - Starts the linking process. Override generic links - Creates permanent global links between your controller, FL Studio and plugins. Established links will become active only when the window or plugin hosting the software control is focused (click anywhere on the window / plugin to focus the interface). Formulas & smoothing: Generic links do not support mapping formulas & smoothing. Temporary links have higher priority and will replace the generic links for the current session/project. Controller type: Links made with the multilink function will only work as expected from a controller of the same type. Selecting a new controller may result in unexpected links between the controller, FL Studio & plugins. MIDI channels: Up to 16 separate MIDI controllers can be used simultaneously. To link multiple controllers select unique MIDI channels for each controller prior to initiating the multilink process (don't forget to enable each controller in the MIDI settings). The multilink process remembers both the MIDI CC and MIDI channel of the link. Randomize - Randomizes the values of any tweaked controls. Turn on the switch, tweak controls, then select this option. Humanize - Adds a small random variation to any tweaked controls. Turn on the switch, tweak controls, then select this option. Cancel - Stop the linking process and forget all links. Step Editing (Ctrl+E) - Switches step entry allows you to step-wise enter notes into the Piano roll. See the link for details. Note / Clip Grouping - Enables / Disables Piano roll note and Playlist pattern grouping. TIP: Disable this Global option to make changes to members of Clip or Note Groups, then re-enable it to return the edited member to the original Group. Use the Piano roll & Playlist 'Group' options to group/ungroup selected notes/patterns. Line - Events snap to the nearest grid-line, notice that the grid changes resolution as the Piano roll, Playlist or Event Editor are Zoomed horizontally.